Yay! I'm so glad you're here! I haven't blogged in FOREVER. After adjusting to a new grade level last year I needed some time off. 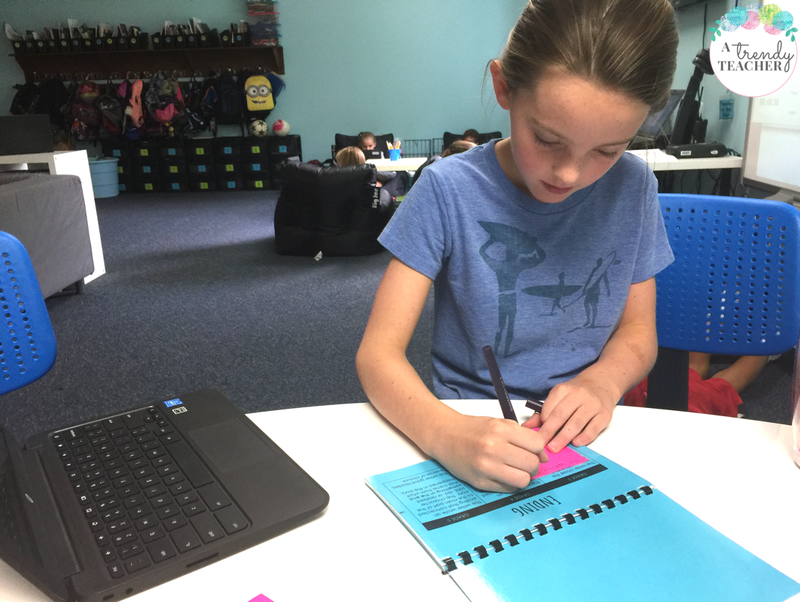 Now that I'm in year 2 of 4th grade I thought I'd give this whole blogging thing another shot. Lately there's been a lot of talk in our district about using Learning Progressions with students to lift the level of the reading and writing during workshop. I should add, we are using the Lucy Calkins units of study for reading and writing. I don't know about you, but if you've seen the way Lucy crams all that information into a 2 page learning progression you're probably as overwhelmed as I am. I decided that in order for these progressions to be useful for my learners I had to make them kid friendly! I started by taking the grade 3-5 pieces of the progression and separated them by topic (lead, transitions, ending, craft, etc.). Then I thought about the annotated student work in the Pathways book. Behind each micro-progression I've included a student example that shows what is expected at the 4th grade level. This new tool has completely changed my writing conferences. It is my go-to! After asking the student to tell me about their writing goal we flip through the progressions and find a place to work from. The student pictured above was checking in with me to show that she moved her lead to the 5th grade level. After we found evidence to support this she went back into the progressions, chose a new area to focus on and she's now taking notes on how she plans to revise her ending. If you're interested in using these micro-progressions with your students too you can access this resource below. *This is not my own work, this resource is adapted from Lucy Calkin's Writing Units. Click here to view the Narrative Writing Progression Mini Book. Click here to view the Opinion Writing Progression Mini Book. Check back for the Informational Writing Progression Mini Book. These free resources are brought to you by A Trendy Teacher. If you're looking for a way to give back to our classroom, check out our Amazon Wish List. 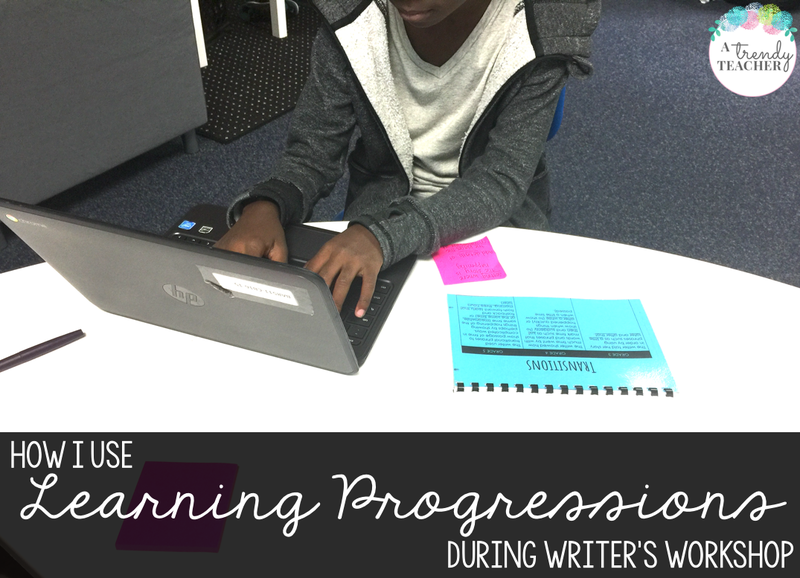 I'd love to hear about how you use the Learning Progressions during your workshop. Let me know in the comments! I am a teacher in Saudi Arabia and find these resources most helpful! I hope that i could purchase it for my grade 4 class. Hey! I'd love to see the learning progressions for Information writing too! These are great! Do you still use them? What a great idea... the progressions are so tiny, my eyes can't read them. I'm going to get started on making these for Kindergarten. Thank you! Thanks so much! Looking forward to seeing the "Informational Writing," packet! Thank you SO much for sharing! Do you have your students create goals in each area at the beginning of the writing unit or do they only choose one goal at a time (for example, working on just the lead until he/she meets that goal and then he/she makes a new goal)? Wow, this is super helpful! Thank you for sharing this strategy. I'm off to create a 5th grade version!